IBM Tivoli® Composite Application Manager (ITCAM) for Transactions provides end-to-end transaction tracking and visualization capabilities, allowing IT teams to more quickly and easily isolate problems and, in turn, allowing faster problem resolution. This comprehensive solution also provides capabilities for real end-user monitoring, robotic monitoring, and Internet service monitoring. Managing a mixed platform and vendor IT environment presents many challenges. The problems escalate with the number of different tools used to manage the infrastructure. Customers are looking to reduce the number and variety of management tools they must use. 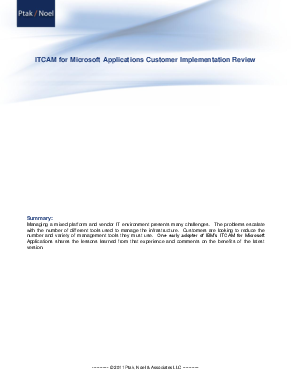 One early adopter of IBM’s ITCAM for Microsoft Applications shares the lessons learned from that experience and comments on the benefits of the latest version.